While the two heaviest hitters of the DC Comics Universe, Batman and Superman have already made their invigorated return to their roots debuts as part of the DC Comics Rebirth, it's hard to overlook the excitement focused on just as many superheroines as heroes. Batman and Superman have enjoyed the medium's best talents from the very start, but with bold new directions promised by the creative teams behind "Wonder Woman" (including hints at Diana's sexuality), "Batgirl" (headed around the world, literally), Superwoman (Lois Lane getting her time to shine) and Harley Quinn's new "Suicide Squad," there's never been a more promising time for the ladies of the DC Universe. And as popular a mascot as the Joker's girlfriend may be, she's not the only heroine the publisher is doubling down on. Barbara Gordon a.k.a. Batgirl will be returning in not one, but two title series. And now that "Batgirl and the Birds of Prey: Rebirth" #1 has been released, seasoned fans or brand new readers have a clear idea of how the two series will run alongside the other - and their first evidence of why every fan of DC's lady leaders will want to watch as this version of the Birds of Prey gets back together... for the first time. Confused? The first issue helps lay out the main players, their origins, relationships, and the mysterious villain setting their sights on the legacy of the entire Bat-Family. The issue actually acts as one of the most welcoming and approachable comics in the entire "Rebirth" line-up, giving a breakdown of... well, the entire career of Barbara Gordon to the current time. Writers Julie and Shawna Benson make a few important distinctions for even seasoned fans: for starters, that it wasn't her love of Batman that inspired her to don a costume of her own and take up crime as 'Batgirl,' but the admiration she had for her father, police commissioner Jim Gordon, similarly devoting his life to fighting evil. In fact, it was only when Jim Gordon stopped Barbara from following his lead in investigation and detective work that she turned to the only path left: vigilantism. As powerful a character and role model as Barbara Gordon was in her Batgirl persona (driven to protect the innocent not by trauma, but her beliefs), it could be argued that being confined to a wheelchair paved the way for her to become a truly unique, empowering, and fan-favorite comic heroine. Instead of giving up due to a crippling injury, she would remain true to her ideals, and find a new way to be powerful and dangerous to those who deserved it. In "Rebirth" #1 that transition is framed not as Barbara 'making the best' of her situation, but finally achieving her true calling. Instead of taking her information, contacts, or hacked intelligence to Batman to have him swat it down - even if it was just to keep her safe - Barbara had no other option but to pursue it herself, becoming the all-knowing, all-seeing 'Oracle.' It was in this role where Barbara crafted her own place in the history of the Bat-Family, acting as mole, insider, and switchboard for Batman and his many allies. And if knowledge is power, then Barbara became more powerful than she ever could have by Batman's side in Gotham's alleyways (at least physically). Barbara's shift from the paralyzed Oracle to the back-in-action Batgirl of the New 52 was a little murky, so the Bensons' explanation of "experimental surgery" granting her the use of her legs is probably the simplest explanation to be taken and run with. The bottom line is that the Oracle represents a victory to Batgirl, the Batman Family, and the readers. Still, having all the knowledge in the world still required someone to act on it. And with Barbara confined to a wheelchair, she had to turn to someone else. Someone who possessed the same skills, the same heroic spirit, and the same distrust for the establishment (or authority figures): Dinah Lance, known to the evening streets as the Black Canary. Together, the "Rebirth" issue tells us, they became known as the 'Birds of Prey,' which, in this version, seems to have been limited to only themselves - one, the brain, the other, the fists. But as Barbara moved from the wheelchair back onto the street, the need for Dinah - and the Birds of Prey - faded. They may have gone on to have a long and illustrious career in the original comic continuity, but in the current one, the days of Barbara and Dinah working together are long done. But even if this Canary is now working as muscle for a rock band she used to appear in, it only takes a mention of the identity she and Babs built together to have her back in the fight (for one night only). In this case, evidence that a new information broker is selling intel to criminals using Oracle's name is enough - Dinah and Barbara are putting an end to the operation. 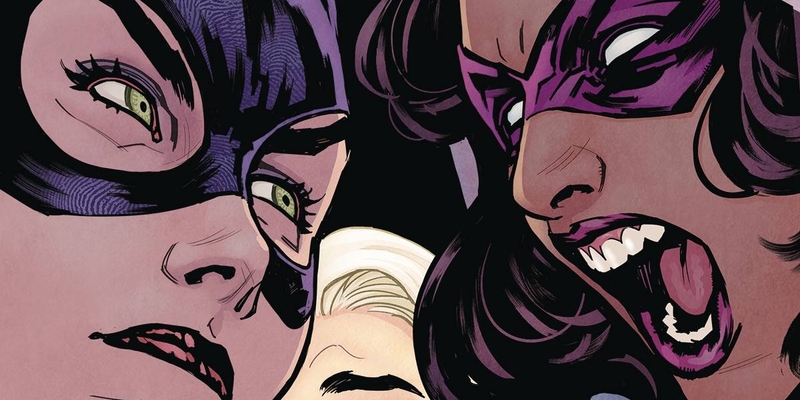 Good news for those who feel that it just isn't the Birds of Prey without Huntress, too, since the first "Rebirth" issue makes sure to set Helena Bertinelli on a collision course with Babs and Dinah. It appears that the origin story at work here is the one most comic fans will recognize - and the same one that set Huntress so distinctly apart from her fellow fighters. Where fighting crime is in Barbara's blood, and Dinah is just too rebellious to let the little guy get pushed around, Helena was a bit more of an enigma. Having seen her entire family killed in a mob war, she's out for vengeance... revenge on whoever deserves it, despite being a devout Catholic in most incarnations. That idea is driven home by her introduction here, in a confession booth speaking to the corpse of a mob hitman (priest?) she has just executed. This version of Helena Bertinelli is actually already known to readers of DC's New 52, having recruited the star of "Grayson" into the spy agency known as SPYRAL. Operating under the code name 'Matron,' and eventually leading the agency as a whole, Bertinelli's time at SPYRAL came to an end just before "Rebirth" launched (see her adoption of the 'Huntress' identity in "Nightwing: Rebirth" #1). So in seeking out mob hitmen like the ones responsible for her own life's tragedy, Helena inevitably winds up pursuing the same man as Dinah and Barbara. And, thanks to her time in the spy community, the Birds of Prey are no mystery to Huntress. And it's here where the Bensons' premise takes hold: three women with varying reasons and degrees of investment coming to a head on a city street - with armed mob gunmen lying wounded or unconscious around them - and deciding what happens next. On a large scale, it differs from other "Rebirth" issues that simply establish a launching point for the actual #1 to begin. But with the story clearly under way, the issue succeeds in not just showing street-level crimefighting, but an organic superhero team-up (or standoff, if the cover art is any indication). Not only that, but one which shifts the spotlight to the people - and more specifically, the women - who are populating the DC Universe outside of the Justice League heavyweights. So, who is this new 'Oracle' who has gained access to Barbara Gordon's moniker, and potentially her information, and is selling it to criminals? That's kept a mystery for now, but the issue ends with a tease that the villain now also knows the real identities of Batgirl and Black Canary. The coming weeks will likely reveal more of the story - and whether it has specific ties to Barbara's solo series, Huntress' previous comic storyline, or any combination thereof (our money is always on Damien Wayne getting up to nod good in his free time). From a story perspective, "Batgirl and the Birds of Prey: Rebirth" #1 is an easy recommend, especially for readers who have noticed the growing status of the titular heroines - or heard rumors that they may be joining the DC movie universe - and were curious on where to start. Here is as good a place as any, as it pushes the cosmic and supernatural to the background in favor of some good old-fashioned punches, kicks, and fishnet stockings. Batgirl and the Birds of Prey: Rebirth #1 is available now.